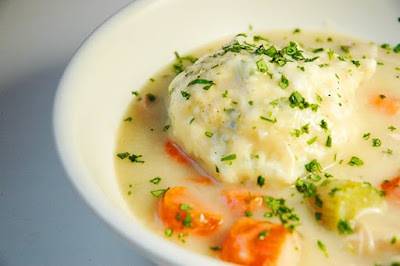 Chicken and dumplings stew is quintessential comfort food. Dont get me wrong, I love CLASSIC MACARONI AND CHEESE, but sometimes a nice stew does the job like no other! This dish is perfect for these cold winter nights. I make a big pot of this and have it for dinner the rest of the week! This is an extremely easy recipe to make, so give it a try! Poach the chicken in the stock. This looks so incredibly good it’s making me really hungry. This looks so comforting and delicious, and it is something I have never made! Thanks Kay and Jillian! This recipe is really easy to make and it’s super yummy and hearty. I found your blog via FoodGawker. Your Easy Chicken and Dumplings is the ultimate comfort food. I’ve seen many posts using Tarragon lately; I’ll have to seek out that herb. Happy New Year! Is a whole chicken cut into pieces used? Not sure how much chicken to poach. OMG, thanks for catching that error. I totally forgot to specify how much chicken! Yes, a whole chicken…2 thighs, 2 legs, 2 breasts. You can use individual pieces or cut up a whole chicken. I prefer dark meat so sometimes I just use thighs and legs. Oooh my Husband would love this! I’ve bookmarked it to make soon.